In the Motion Assignment post, I mentioned how things which move are all around us. Sometimes they show up right in your own town. 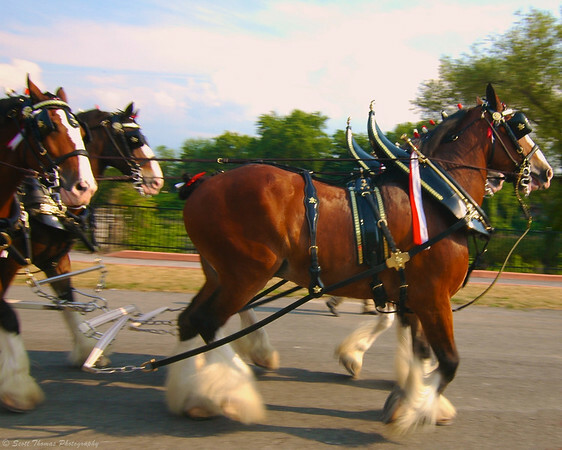 Budweiser Clydesdales moving along the shore of the Seneca River in Baldwinsville, New York. Nikon D70/Tokina 11-16mm, 1/50s, f/18, ISO 200, EV 0, 16mm focal length. The Syracuse Nationals gave me another opportunity to look for things in motion. Not as easy as you might think as most of the cars are on display and motionless. Unless you get there in time to see a few of the late comers showing up. 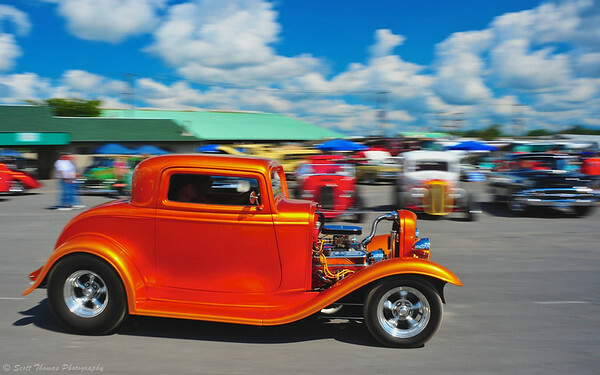 An orange coupe hot rod entering the New York State Fairgrounds for the 2012 Syracuse Nationals Car Show. Nikon D700/28-300VR, 1/30s, f/22, ISO 200, EV +0.3, 28mm focal length. Cruising the vendor tables, I came upon these battery operated toys moving and spinning about. 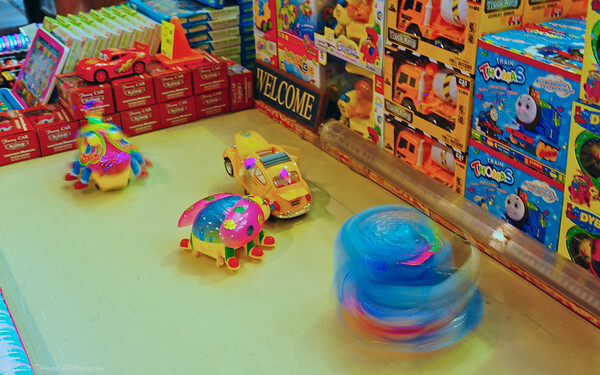 Toys move and spin at a vendors booth at the 13th annual Syracuse Nationals Car Show. Nikon D700/28-300VR, 1/3s, f/8, ISO 200, EV +0.3, 38mm focal length. 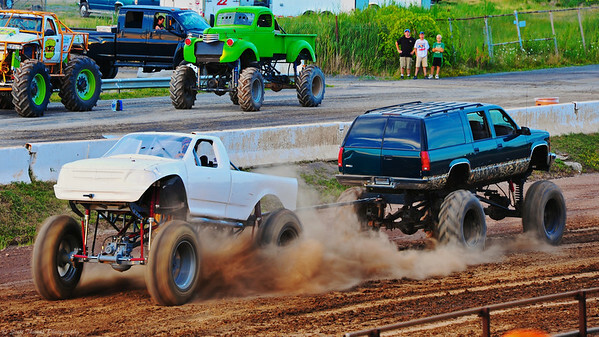 The monster trucks had a tough time getting traction in the dirt and mud in front of the Grandstands at the New York State Fairgrounds during a game of Tug-O-War. Monster trucks spin their wheels in a game of Tug-O-War during the 13th annual Syracuse Nationals Car Show in front of the Grandstand at the New York State Fairgrounds. Nikon D700/28-300VR, 1/20s, f/9, ISO 200, EV 0, 219mm focal length, cropped. This is my submission for the assignment. Click here so see how others tackled showing Motion in a still image. This entry was posted in Assignments and tagged 28-300mm, baldwinsville, blur, budweiser, clydesdales, coupe, draft, grandstand, horses, hot rod, monster, motion, nationals, new york, nikon D70, nikon D700, orange, panning, spin, syracuse, tires, tokina 11-16mm, toys, truck, wheels. Bookmark the permalink. LOVE the poofy, moving clydesdale feet! That spinning toy looks really cool too. Thanks for another fun assignment, Scott. I’m off to check out the other entries that I haven’t seen yet. Love the coupe in this one as well, great shots Scott !! Coupes are my favorite kind of hot rod and of all the cars I panned in this location, this was the one I wanted to get right.